The β-herpesvirus CMV induces a substantial and progressive expansion of virus-specific memory CD8 T cells, which protect the host against viral reactivation from latency. In this paper, we report that this expansion, or “inflation,” of memory T cells is amplified dramatically during mouse CMV infection of IL-10 knockout (IL-10−/−) mice. T cells from IL-10−/− mice were oligoclonal, exhibited a highly activated phenotype, expressed antiviral cytokines, and degranulated in response to cognate Ag encounter ex vivo. Moreover, latent viral load was reduced in IL-10−/− mice. Importantly, these results were recapitulated by IL-10R blockade during chronic/latent infection of wild-type mice. These data demonstrate that regulatory immune mechanisms can influence CMV-specific T cell memory and suggest a possible rationale for the acquisition of functional IL-10 orthologs by herpesviruses. Human CMV (HCMV) is a β-herpesvirus that infects 70–90% of the human population. Although primary HCMV infection is typically asymptomatic, it causes multiorgan disease in unborn children and immune compromised seronegative adults (1). HCMV also establishes a latent infection that is generally well contained by healthy hosts. However, in individuals with impaired immune function, such as transplant recipients receiving immunosuppressive drugs, latent virus can reactivate and induce severe clinical disease (2, 3). Furthermore, indirect effects such as acute and chronic graft rejection can be triggered by these events (3). CD8 T cells are critical mediators of antiviral immune responses to HCMV. Viral reactivation in immune suppressed individuals is associated with a numerical and functional impairment of virus-specific CD8 T cells (4–7), and adoptive transfer of CD8 T cells affords protection from virus reactivation and viremia (8–11). In addition, using the mouse CMV (MCMV) model of infection, it has been shown that adoptive transfer of CD8 T cells protects immune-suppressed hosts from infection (12–15). Critically, MCMV reactivation from latency is also controlled by CD8 T cells (16). CMV-specific CD8 T cells expand to unusually high frequencies in immune competent humans and mice (17, 18), a phenomenon that has been termed “memory inflation” (19). During MCMV infection, the memory CD8 T cell pool consists of “stable” memory T cells that are present at low numbers and “inflationary” memory T cell populations that expand to high frequencies as infection progresses (19–21). Inflation of memory T cells is Ag dependent (22), and phenotypic analysis suggests that these cells are highly differentiated and have recently been exposed to Ag (20, 21, 23–25); thus, it appears that periodic viral reactivation events drive the expansion of these cells. However, it is unclear whether immunological factors also regulate this process. 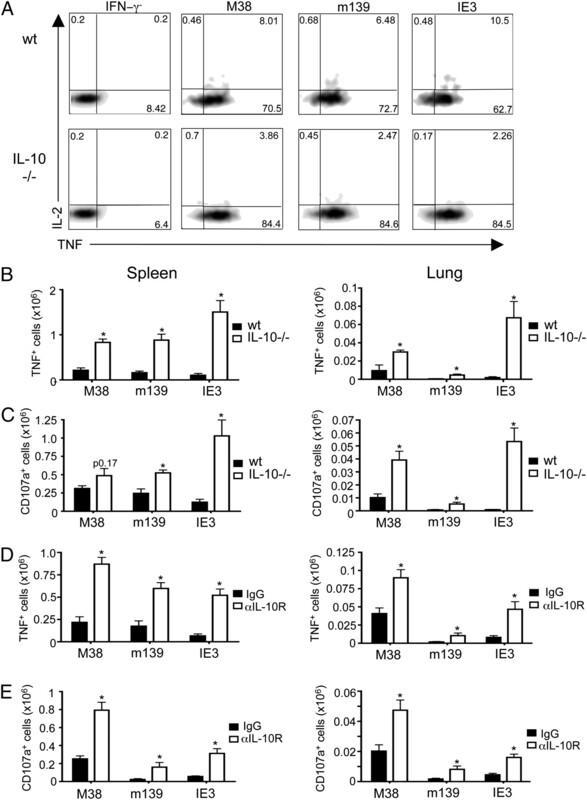 IL-10 is an immune regulatory cytokine that suppresses T cell responses primarily via effects mediated on APCs; specifically, IL-10 inhibits the expression of proinflammatory cytokines and chemokines, MHC class II, and costimulatory molecules by APCs (26, 27). During viral infections, IL-10 has paradoxical functions. In models of acute influenza (28) and herpes simplex infection (29), IL-10 limits immunopathology. In contrast, IL-10 antagonizes protective immunity following high-dose influenza challenge (30) and MCMV persistence in the salivary glands (31). Moreover, IL-10 induction during chronic lymphocytic choriomeningitis virus infection promotes functional dysregulation of T cells and lymphopenia, thereby enabling prolonged viral replication (32, 33). The expression of a functional IL-10 ortholog (viral IL-10 [vIL-10]) by HCMV indicates the importance of IL-10 in the suppression of HCMV-specific immunity (34, 35). Intriguingly, in vitro experiments have demonstrated vIL-10 mRNA expression during latent HCMV infection (36) and suggest that vIL-10 may inhibit memory CD4 T cell recognition of latently infected cells (37). To date, however, nothing is known regarding the role of IL-10 in the regulation of CMV-specific memory T cell responses in vivo. In the current study, we show that IL-10 is a potent inhibitor of memory T cell inflation during MCMV infection. We observed a massive accumulation of T cells expressing antiviral cytokines in MCMV-infected IL-10 knockout (IL-10−/−) mice. This was associated with enhanced CD4 T cell immunity and APC recruitment to sites of viral latency. Using an Ab that blocks the IL-10R, we also demonstrated that IL-10 inhibits memory T cells during chronic/latent infection. Critically, enhanced immunity at this time following either IL-10 gene deletion or IL-10R blockade led to a reduction in viral load. Collectively, these data suggest that IL-10 promotes the long-term maintenance of CMV by limiting the expansion of functional antiviral memory T cells. IL-10−/− mice were purchased from The Jackson Laboratory (Bar Harbor, ME) and bred in-house; wild-type C57BL/6 mice were purchased from Harlan U.K. (Blackthorn, U.K.). All experiments were conducted according to the U.K. Home Office guidelines. Specifically, these experiments were performed under a Home Office project license (granted to I.R.H.) in the Home Office-designated facility at Heath Park, Cardiff University (Cardiff, U.K.). MCMV Smith strain (American Type Culture Collection, Manassas, VA) was prepared in BALB/c salivary glands and titered on 3T3 cells as described previously (38). Mice were infected i.p. with 5 × 104 PFU MCMV. In some experiments, wild-type mice were injected on the days stated in the figure legends with 250 μg of either rat IgG (Chemicon International, Temecula, CA) or anti–IL-10Rα (clone 1B1.3A; BioXCell, West Lebanon, NH). To evaluate MCMV-specific CD8 T cell responses, splenocytes and lung leukocytes were isolated from infected mice and incubated at 5 × 106 cells/ml for 5 h at 37°C with 2 μg/ml MCMV-derived peptides (GenScript, Piscataway, NJ) in the presence of either 0.7 μg/ml monensin and anti–CD107a-FITC (both BD Pharmingen, San Diego, CA; IFN-γ and CD107a detection) or 2 μg/ml brefeldin A (Sigma-Aldrich, St. Louis, MO; IFN-γ, TNF, and IL-2 detection). The optimal length peptides used in this study were as follows: 1) SSPPMFRVP (origin, M38; restriction, H-2Kb); 2) HGIRNASFI (origin, M45; restriction, H-2Db); 3) TVYGFCLL (origin, m139; restriction, H-2Kb); and 4) RALEYKNL (origin, immediate-early 3 [IE3]; restriction, H-2Kb) (20). Cells were then washed and incubated with Fc block (eBioscience, San Diego, CA). After incubation with peptide or medium alone as a control, cells were surface stained with anti–CD8α-allophycocyanin-H7 (BD Pharmingen). All cells were then fixed with 3% formalin, permeabilized with saponin buffer (PBS, 2% FCS, 0.05% sodium azide, and 0.5% saponin), and stained with the relevant combinations of anti–TNF-PE-Cy7, anti–IL-2-Pacific blue, and anti–IFN-γ-FITC (all eBioscience). To calculate percentage of virus-specific effector function, spontaneous degranulation or cytokine production in medium controls was subtracted from peptide-induced mobilization or expression, respectively. To identify MCMV-specific CD4 T cells, splenocytes and lung leukocytes were incubated for 5–16 h at 37°C with 2 μg/ml brefeldin A (Sigma-Aldrich) and 3 μg/ml MCMV-derived peptides (Genscript) restricted by MHC class II as follows: 1) GYLYIYPSAGNSFDL (origin, m09); 2) NHLYETPISATAMVI (origin, M25); 3) TRPYRYPRVCDASLS (origin, m139); and 4) RSRYLTAAAVTAVLQ (origin, m142) (39). To identify IL-10 expression by B cells and macrophages, splenocytes were stimulated for 5 h at 37°C with either 10 μg/ml LPS (macrophages) or 10 μg/ml LPS, 50 ng/ml PMA, and 500 ng/ml ionomycin (B cells; all reagents from Sigma-Aldrich). Cells were then incubated with Fc block and surface stained with either anti–CD4-Pacific blue (BD Pharmingen), anti–CD19-FITC, or anti–CD11b-PE-Cy7 prior to permeabilization and intracellular staining with anti–IFN-γ-FITC (CD4 analysis only) and anti–IL-10-allophycocyanin (all eBioscience). The percent virus-specific cytokine production by CD4 T cells was calculated as described for CD8 T cells. To assess APC accumulation, unstimulated splenocytes and lung leukocytes were incubated with Fc block and then stained with anti–CD11b-allophycocyanin-Cy7 (BD Pharmingen), anti–CD11c-PE-Cy7 (BD Pharmingen), anti-MHC class II-PE-Cy5 (eBioscience), anti–F4/80-Pacific blue (BioLegend, San Diego, CA), anti–Gr1-FITC (BioLegend), and anti–7/4-PE (Serotec, Oxford, U.K.). To examine the expression of surface molecules by MCMV-specific CD8 T cells, 1 × 106 splenocytes were incubated with Live/Dead Fixable Aqua (Invitrogen, Carlsbad, CA), followed by Fc block, then stained with H-2Kb tetramers loaded with M38, m139, or IE3 peptides. Cells were then stained with anti–CD3-PerCP-Cy5.5 (BD Pharmingen), anti–CD8-allophycocyanin-H7 (BD Pharmingen), and either anti–CD44-FITC (BioLegend), anti–CD62L-PE-Cy7 (Abcam), and anti–CD122-PE (eBioscience) or anti–killer cell lectin-like receptor subfamily G member 1 (KLRG-1)-FITC (Southern Biotechnology Associates, Birmingham, AL), anti–CD27-PE (eBioscience), and anti–CD127-Pacific blue (eBioscience). All data were acquired on either a BD FACSCanto II or a modified FACSAria II cell sorter equipped for the detection of 18 fluorescent parameters (BD Immunocytometry Systems, San Jose, CA). Electronic compensation was performed in all cases using Ab capture beads stained separately with the individual mAbs used in each experimental panel. A minimum of 30,000 events was acquired in each case, and data were analyzed using FlowJo software version 8.5.3 (Tree Star, Ashland, OR). In all experiments, total numbers of different cell populations were calculated by multiplying the total number of viable splenic or pulmonary leukocytes (assessed by trypan blue exclusion) by percent positive cells, as detected by flow cytometry. Total numbers of virus-specific T cells were calculated by: total T cell number (CD4 or CD8) × percent peptide-specific IFN-γ+ cells (calculated as described above). Total numbers of virus-specific TNF+ or CD107a+ T cells were calculated similarly. Clonotypic analysis of cognate Ag-specific CD8 T cell populations was conducted as described previously with minor modifications (40, 41). Briefly, tetramer-labeled CD8 T cells (median, 3200; range, 808–5000) were sorted viably into 1.5-ml microtubes containing 100 μl RNAlater (Applied Biosystems, Foster City, CA), and unbiased amplification of all expressed TCRB gene products was conducted using a template-switch anchored RT-PCR with a 3′ TCRB C region primer (5′-TGGCTCAAACAAGGAGACCT-3′). Amplicons were subcloned, sampled, sequenced, and analyzed as described previously (42). The International ImMunoGeneTics Information System nomenclature is used throughout this report (43). Genomic DNA was isolated from spleen and lung tissue (Qiagen, Valencia, CA), and MCMV glycoprotein B (gB) was then assayed by quantitative PCR using a Mini Opticon (Bio-Rad, Hercules, CA) and Platinum SYBR green mastermix reagent (Invitrogen). One hundred-nanogram aliquots of DNA were used as templates for each reaction. The primer sequences used for detection of β-actin were 5′-GATGTCACGCACGATTTCC-3′ and 5′-GGGCTATGCTCTCCCTCAC-3′; primers used for detection of gB were 5′-GAAGATCCGCATGTCCTTCAG-3′ and 5′-AATCCGTCCAACATCTTGTCG-3′. Genome copy numbers were calculated using a standard curve generated with the pARK25 MCMV plasmid (a gift from A. Redwood, University of Western Australia, Perth, Western Australia, Australia) with the limit of detection = 10 copies. IL-10 and gB were assayed by quantitative RT-PCR using a Mini Opticon and Platinum SYBR green mastermix reagent (Invitrogen). For IL-10 expression analysis, lung and spleen cells from mock or MCMV-infected mice were frozen on dry ice in TRIzol reagent (Invitrogen). Thawed samples were homogenized, and total cellular RNA was extracted and quantified. DNase-treated RNA was then used to synthesize cDNA with a TaqMan reverse transcription kit (Applied Biosystems). The primer sequences used for detection of IL-10 were 5′-AGCATGGCCCAGAAATCAAG-3′ and 5′-CGCATCCTGAGGGTCTTCA-3′. For gB expression analysis, RNA was isolated from lung and spleen tissue (Qiagen); cDNA was then synthesized as described above, and gB and actin were measured using the primers detailed above. Virus-infected organs were divided into three parts and placed in separate wells in a 6-well plate containing 5 ml (spleen) or 3 ml (lung) D10 medium. Tissue was gently minced with the end of a 2-ml syringe, and in the case of lung pieces, an additional 2 ml D10 was then added. Tissue pieces were then cultured for 5 wk; 4 ml supernatant was collected weekly and replaced with 5 ml fresh D10. Sonicated supernatant was then assayed for infectious virus by plaque assay as described previously (38). In our C57BL/6 mouse model of MCMV infection, productive replication (data not shown) and late viral gene expression (Supplemental Fig. 1A) were undetectable in the spleen and lung by 60 d postinfection. In contrast, viral DNA was present in both organs, and virus could reactivate ex vivo in cultures of spleen and lung isolated as late as 110 d postinfection (Supplemental Fig. 1B), thereby suggesting that MCMV persisted in these organs primarily in the form of latent virus. Despite the absence of detectable MCMV replication from day 60, expression of IL-10 in the spleen (but not lung) was increased compared with uninfected mice (Fig. 1A). Flow cytometric analyses revealed IL-10 protein production by splenic IFN-γ+IL-17− MCMV-specific CD4 T cells after peptide stimulation directly ex vivo (Fig. 1B). The frequency of IL-10–producing cells within MCMV-specific CD4 T cell populations was substantially higher than that observed in IFN-γ− CD4 T cells (3.7–8.3%, mean = 6.3 versus 0.08–0.3%, mean = 0.19%; p < 0.01). Splenic B cells (CD19+) and monocytes/macrophages (CD11b+) derived from mice 90 d postinfection were also capable of producing IL-10 following ex vivo nonspecific stimulation; in the case of CD11b+ cells, but not CD19+ cells, this MCMV-associated IL-10 production was significantly increased compared with cells derived from naive mice (Fig. 1C). IL-10 limits memory CD8 T cell inflation during MCMV infection. A, IL-10 expression in spleen extracts from naive C57BL/6 (wt) mice and wt mice infected for 90 d with MCMV was measured by quantitative RT-PCR and normalized to β-actin. Results represent the mean ± SEM of four mice from two independent experiments. *p < 0.05 with the Mann-Whitney U test. B, IFN-γ, and IL-17 expression by CD4 T cells derived from spleens of wt mice 90 d postinfection (top panels) following ex vivo stimulation for 16 h with (top left panel) or without (top right panel) m09, M25, m139, and m142 peptides. Values in quadrants represent percent cytokine+CD4+ cells. Expression of IL-10 by IFN-γ+ peptide-specific CD4 T cells from wt (bottom left panel) and IL-10−/− (bottom right panel) mice. Quadrants were set using the fluorescence minus one controls. Results are representative of two experiments, each comprising four mice per group. C, IL-10 expression by splenic CD19+ and CD11b+ cells derived from naive (▪) and MCMV-infected (day 60 postinfection; □) mice following ex vivo stimulation with LPS and PMA/ionomycin (CD19+) or LPS alone (CD11b+). Results are shown as the mean ± SEM derived from two independent experiments, each comprising four mice per group. Ex vivo stimulation of B cells from MCMV-infected mice (day 90 postinfection) did not induce significant apoptosis (6.6 ± 0.4% AnnV+) as compared with freshly isolated CD19+ cells (8.2 ± 2.2% AnnV+). D and E, wt (●) and IL-10−/− (○) mice were infected with MCMV, and peptide-specific CD8 T cells were quantified by intracellular IFN-γ detection. D, Numbers of CD8 T cells specific for M38, M45, m139, and IE3 on days 0, 7, 14, 30, and 90 postinfection in spleen (left panels) and lung (right panels). Results are expressed as mean ± SEM cells/organ of four to six mice per group, and each time point represents four to seven experiments. *p < 0.05 with Student t test. E, Representative bivariate flow cytometry plot showing IFN-γ expression by IE3-reactive CD8 T cells in the spleens (top panels) and lungs (bottom panels) of wt (left panels) and IL-10−/− (right panels) mice at day 90 postinfection. The percent CD8 T cells expressing IFN-γ is shown; gates were set using the fluorescence minus one control for FITC. Results are representative of seven experiments, each comprising four to six mice per group. wt, wild-type. We hypothesized that IL-10 acts to inhibit systemic and mucosal antiviral T cell responses during MCMV infection. To test this, we measured the accumulation of both “stable” memory CD8 T cells specific for a peptide derived from the M45 protein that is immunodominant during acute infection and “inflationary” memory CD8 T cells specific for peptides derived from the M38, m139, and IE3 proteins in both wild-type C57BL/6 and IL-10−/− mice. Expression of these viral proteins in infected cells is thought to occur during productive replication rather than viral latency (20, 44). 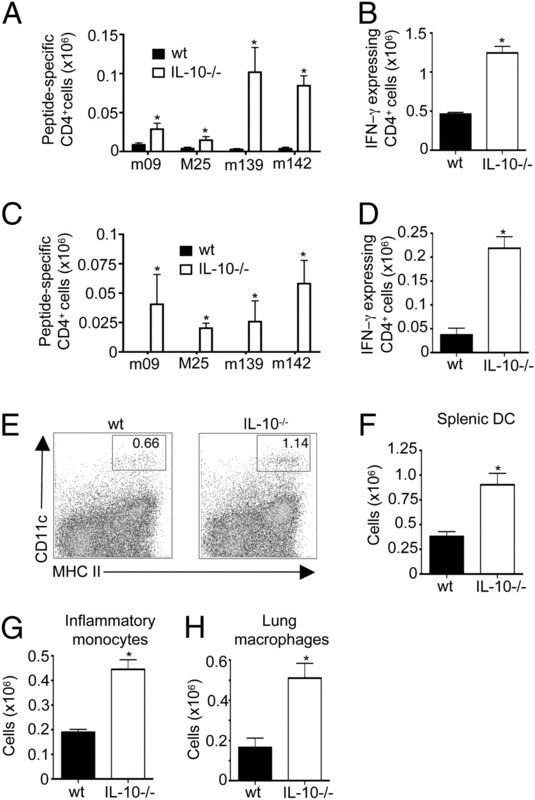 During acute infection, there were comparable numbers of MCMV-specific CD8 T cells in the lungs and spleens of wild-type and IL-10−/− mice (Fig. 1D); furthermore, as infection progressed, the numbers of M45-specific memory CD8 T cells remained low in the absence of IL-10 (Fig. 1D). Consistent with previously published data (20), high frequencies of CD8 T cells specific for M38, m139, and IE3 were observed in wild-type mice at day 90 postinfection; strikingly, however, the corresponding frequencies at the same time point were even higher in IL-10−/− mice (Fig. 1D). The accumulation of IE3-specific CD8 T cells was most notable, representing ~15% of all CD8 T cells in IL-10−/− mice at day 90 postinfection (Fig. 1E) and reaching up to 30% in some individual mice (data not shown). To investigate further the profound expansion of IE3-specific CD8 T cells, we undertook a comprehensive and unbiased analysis of TCR gene usage within the cognate populations isolated directly ex vivo from both wild-type and IL-10−/− mice (Fig. 2 and, for complete data set, Supplemental Fig. 2). In both sets of mice at day 90 postinfection, the IE3-specific TCR repertoires were oligoclonal and highly skewed toward the usage of only a few dominant clonotypes; this is consistent with previous studies of HCMV-specific CD8 T cell populations (42). Moreover, a diverse array of clonotypic structures was apparent in both wild-type and IL-10−/− mice, although with a strong bias toward TRBV16 usage (Fig. 2, Supplemental Fig. 2). Similar patterns were observed as late as day 282 postinfection, at which time IE3-specific CD8 T cells dominated the response in IL-10−/− mice (Supplemental Figs. 3–5). In addition, a substantial degree of differentially encoded interindividual TCR sharing was apparent (Fig. 2, Supplemental Figs. 2, 4, and 5); this is consistent with recent studies demonstrating the role of convergent recombination in the generation of “public” clonotypes, which can affect the outcome of infection in certain circumstances (45, 46). Overall, these data suggest that the enhanced inflation of IE3-specific CD8 T cells in IL-10−/− mice is due to the expansion of clonotypes selected within the memory pool rather than the recruitment of greater numbers of cognate clonotypes from the naive pool (47). Oligoconal expansion of IE-3 specific CD8 T cells during MCMV infection. TCRB CDR3 amino acid sequences, TCRBV and TCRBJ usage, and the relative frequencies of individual clonotypes within viable CD3+CD8+IE3−tetramer+ cell populations isolated by flow cytometric sorting from wt (A) and IL-10−/− (B) mice at day 90 post-MCMV infection. Three representative mice are shown per group; colored boxes represent shared clonotypes that were detected in other individual mice. The full data set is shown in Supplemental Fig. 2; analyses from later time points are shown in Supplemental Fig. 4 (day 142 postinfection) and Supplemental Fig. 5 (day 282 postinfection). CD4 T cells promote MCMV-specific memory CD8 T cell expansion (48, 49). We therefore measured the accumulation of virus-specific memory CD4 T cell populations in wild-type and IL-10−/− mice, investigating previously described distinct CD4 T cell populations with specificities for four different viral proteins (m09, M25, m139, and m142) that are associated with active viral replication (39). Interestingly, we found that enhanced CD8 T cell accumulation in IL-10−/− mice at day 90 postinfection was accompanied by a large increase in the number of IFN-γ–expressing CD4 T cells in the spleen (Fig. 3A, 3B) and lung (Fig. 3C, 3D) detected following ex vivo stimulation with MCMV-derived MHC class II-restricted peptides (Fig. 3A, 3C) or PMA and ionomycin (Fig. 3B, 3D). IL-10 can inhibit CD4 T cells by suppressing the function of professional APCs (26, 27) and MCMV-induced IL-10 inhibits MHC class II expression (50). In accordance, we observed more splenic DCs (Fig. 3E, 3F), splenic inflammatory monocytes (Fig. 3G), and pulmonary macrophages (Fig. 3H) in IL-10−/− mice compared with wild-type mice. In contrast, B cell accumulation was comparable in spleens and lungs of wild-type and IL-10−/− mice (data not shown). Elevated CD4 T cell accumulation at day 90 following MCMV infection of IL-10−/− mice. 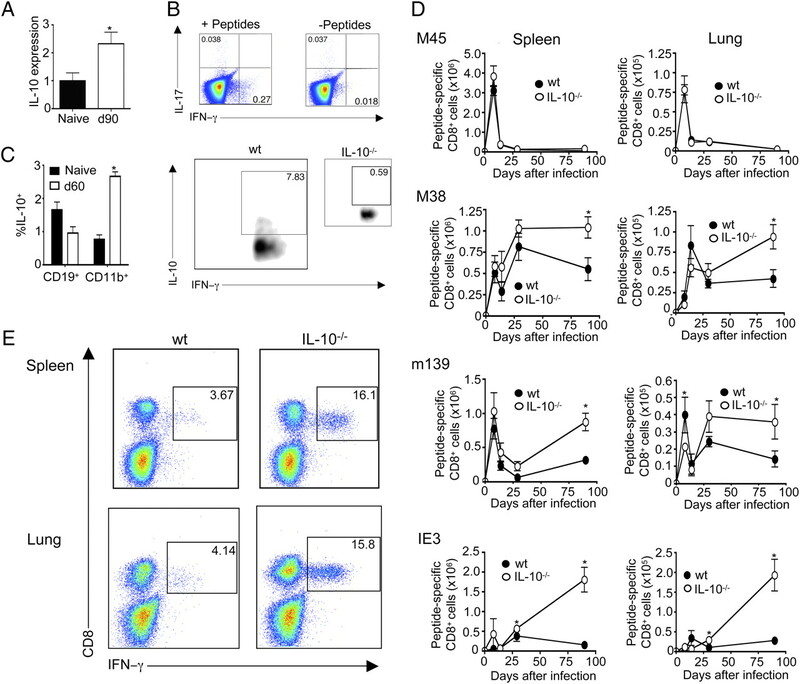 IFN-γ–expressing CD4 T cells in the spleens (A, B) and lungs (C, D) of wt (▪) and IL-10−/− (□) mice at day 90 postinfection following stimulation with peptide (A, C) or PMA and ionomycin (B, D). Undetectable virus-specific CD4 T cells were expressed as an arbitrary value of one cell for statistical analyses. E, Representative flow cytometric analyses of splenic CD11chiMHCII+ dendritic cells from wt (left panel) and IL-10−/− (right panel) mice at day 90 postinfection. Splenic CD11chiMHCII+ (F) and CD11b+CD11c−Gr1lo/−7/4+ monocytes (G) and lung CD11cintCD11b+Gr1lo/−F4/80+ macrophages (H) from wt (▪) and IL-10−/− (□) mice at day 90 postinfection were enumerated. Results represent mean ± SEM of two to three independent experiments, each comprising four mice per group. *p < 0.05 with Student t test. MCMV-specific memory CD8 T cell populations are derived both from cells primed during acute infection and from more recent thymic emigrants (22). Given that IL-10 is expressed during acute MCMV infection (39, 51–53) and suppresses CD4 (52) and, in some models, CD8 T cell responses (53), at this time, we next examined the time point at which IL-10 exerts its inhibitory effect. Blockade of IL-10R signaling during initial T cell priming using a mAb at the time of infection did not significantly influence CD8 T cell numbers specific for M38 and m139 at day 96 postinfection (Fig. 4A). However, IE3-specific CD8 T cells, which are generally undetectable in the first week of infection (20, 22), were enhanced ~2-fold at the day 96 time point (Fig. 4A). This was accompanied by a transient expansion of MCMV-specific CD4 T cell numbers at day 7 (Fig. 4B) but not day 90 (data not shown) postinfection. IL-10 inhibits memory CD8 T cells during acute and chronic/latent MCMV infection. A and B, MCMV-infected wt mice were treated with IgG (▪) or anti–IL-10R (□) on day 0 and peptide-specific CD8 (A) and CD4 (B) T cells were enumerated at day 96 (A) and day 7 (B) postinfection. C–E, wt mice were treated with IgG or anti–IL-10R on days 60, 67, 74, and 81 postinfection. C, Representative bivariate flow cytometry plots showing IFN-γ expression by CD8 T cells specific for M38, m139, and IE3 at day 90 postinfection from mice treated with IgG (top panels) or anti–IL-10R (bottom panels). Peptide-specific CD8 (D) and CD4 (E) T cells were enumerated at day 90 postinfection. MCMV-specific CD4 T cells were stimulated with pooled m09, M25, m139, and m142 peptides. Results are expressed as the mean ± SEM of two independent experiments, each comprising four mice per group. *p < 0.05 with Student t test. Next, we inhibited IL-10R signaling from day 60 postinfection. Importantly, CD8 T cell populations specific for M38, m139, and IE3 were all substantially increased (3- to 4-fold) following late IL-10R blockade (Fig. 4C, 4D), as were MCMV-specific CD4 T cells (Fig. 4E). In the case of IE3-specific CD8 T cells, this increased accumulation was more dramatic than that observed after early IL-10R blockade (Fig. 4A). Thus, IL-10 primarily limits memory T cell accumulation during the chronic/latent phase of infection. In contrast to the phenotypic heterogeneity of the total CD8 T cell population (Fig. 5A), inflationary MCMV-specific memory CD8 T cells from wild-type mice were CD44hiCD62Llo (Fig. 5A), consistent with an effector memory status. Furthermore, these highly differentiated cells expressed high levels of KLRG-1 and low levels of CD27 (Fig. 5A). Memory CD8 T cells specific for MCMV from IL-10−/− mice were also CD44hiCD62Llo (Fig. 5A). Notably, however, the frequency of KLRG-1+CD27− MCMV-specific CD8 T cells was even higher in IL-10−/− mice (Fig. 5A, 5B), and downregulation of CD27 was more pronounced (Fig. 5A, 5C). In addition, receptors for the homeostatic cytokines IL-7 and IL-15 were not upregulated by CD8 T cells from IL-10−/− mice (data not shown). 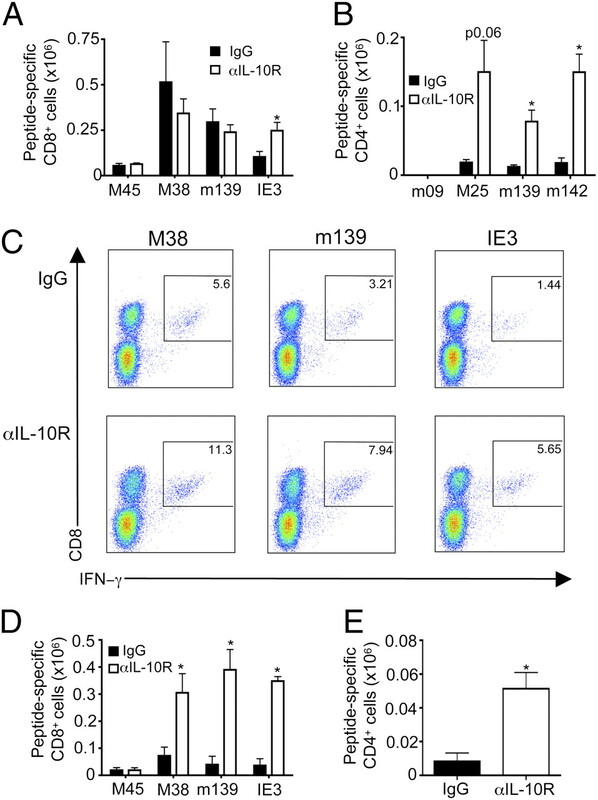 Collectively, these data suggest that IL-10 does not inhibit memory CD8 T cells via the regulation of inhibitory or cytokine receptor expression; furthermore, it seems that the enhanced expansion of inflationary MCMV-specific CD8 T cells in the absence of IL-10 is associated with more advanced differentiation. 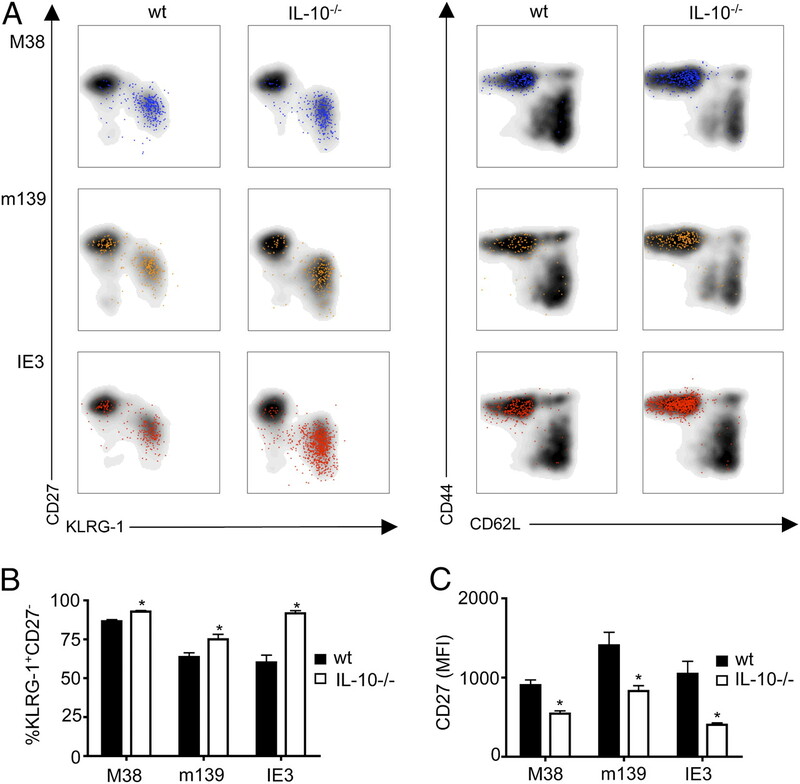 IL-10−/− MCMV-specific CD8 T cells are highly differentiated. MCMV-specific CD8 T cells from spleens of wt and IL-10−/− mice were detected with cognate tetramers and coexpression of CD27, KLRG-1, CD44, and CD62L was examined. A, Coexpression of CD27 and KLRG-1 (left panels), and CD62L and CD44 (right panels), by CD3+CD8+tetramer+ cells (colored dots) and total CD3+CD8+ cells (black/gray) from spleens of wt (left panels in each set) and IL-10−/− (right panels in each set) mice. B and C, The frequencies of KLRG-1+CD27−CD3+CD8+tetramer+ cells (B) and the MFI of CD27 expression by CD3+CD8+tetramer+ cells (C) were assessed. In IL-10−/− mice, the %KLRG-1+CD27− cells in the total CD3+CD8+ population was not significantly increased (wt = 23.5, IL-10−/− = 24.1; p = 0.91) nor was the CD27 MFI (wt = 2564.75, IL-10−/− = 1979.5). p = 0.223). Results are expressed as the mean ± SEM of three experiments, each comprising three to four mice per group. *p < 0.05 with Student t test. MFI, median fluorescence intensity. We next hypothesized that IL-10 limits the accumulation of functional antiviral memory CD8 T cells. Hence, we examined cytokine production by MCMV-specific CD8 T cells. A low proportion (6–10%) of wild-type MCMV-specific IFN-γ+ CD8 T cells coexpressed IL-2 following ex vivo peptide stimulation, and this was further reduced (2–4%) in IL-10−/− mice (Fig. 6A). In contrast, IL-10 deficiency increased both the proportion (Fig. 6A) and the total number (Fig. 6B) of MCMV-specific IFN-γ+ CD8 T cells capable of coexpressing the antiviral cytokine TNF. We also quantified recent degranulation based on cell surface CD107a mobilization and observed greater numbers of CD107a+ MCMV-specific CD8 T cells in the spleens and lungs of IL-10−/− mice compared with wild-type mice after ex vivo peptide stimulation (Fig. 6C). Importantly, IL-10R blockade in wild-type mice from day 60 postinfection also led to an increase in the numbers of virus-specific CD8 T cells that expressed TNF (Fig. 6D) and degranulated (Fig. 6E) in response to peptide stimulation. Collectively, these data suggest that IL-10 restricts the accumulation of functional memory CD8 T cells. IL-10 limits the accumulation of functional antiviral CD8 T cells during MCMV infection. TNF, IL-2, and CD107a expression by IFN-γ+ MCMV peptide-specific CD8 T cells from wt and IL-10−/− mice (A–C) and wt mice treated with IgG or anti–IL-10R (D, E) was assessed at day 90 postinfection. A, Representative bivariate flow cytometry plots showing TNF versus IL-2 expression by IFN-γ− CD8 T cells (control) and IFN-γ+ peptide-specific splenic CD8 T cells from wt (top panels) and IL-10−/− (bottom panels) mice. Results are representative of four experiments, each comprising four to five mice per group. B–E, Numbers of peptide-specific CD8 T cells expressing TNF (B, D) and surface CD107a (C, E) in the spleens (left panels) and lungs (right panels) of wt (▪) and IL-10−/− (□) mice (B, C) and wt mice treated with IgG (▪) or anti–IL-10R (□) on days 60, 67, 74, and 81 postinfection (D, E). All results are representative of three experiments and show the mean ± SEM of evaluations conducted with four to five mice per group. *p < 0.05 with Student t test. To determine whether the increased CD8 T cell responses in IL-10−/− mice reduced latent viral load, MCMV genome content in the lung and spleen was examined. No significant differences were observed at the peak of the primary T cell response (day 7 postinfection; data not shown) or at day 60 postinfection (Fig. 7A). Critically, however, viral DNA load was significantly reduced in both the spleens and lungs of IL-10−/− mice at day 90 postinfection (Fig. 7B). Importantly, late (from day 60 onward) blockade of IL-10R in wild-type mice also led to a reduction in viral DNA load in spleen and lung at this time (Fig. 7C). IL-10 increases latent MCMV load during infection. Genomic DNA was isolated from the spleens and lungs of wt (▪) and IL-10−/− (□) mice at days 60 (A) and 90 (B) postinfection. C, Infected wt mice were treated on days 60, 67, 74, and 81 with IgG (▪) or anti–IL-10R (□), and genomic DNA was isolated from the spleens and lungs at day 90 postinfection. MCMV gB was detected by quantitative PCR, and data expressed as genome copy number per 100 ng genomic DNA; horizontal dashed lines depict the lower limit of detection. Results are representative of two independent experiments and show the mean ± SEM of evaluations conducted with 5–15 mice/group. *p < 0.05 with the Mann-Whitney U test. In this paper, we report that IL-10 suppresses CMV-specific memory T cell inflation. The key findings of this study were that 1) chronic/latent MCMV infection was associated with IL-10 production by macrophages and virus-specific IFN-γ–expressing CD4 T cells; 2) mice deficient in IL-10 exhibited a profound increase in MCMV-specific CD8 T cell accumulation and antiviral cytokine production; 3) IL-10 suppressed the oligoclonal expansion of memory CD8 T cells; 4) MCMV viral genome load was reduced in IL-10−/− mice; and 5) the enhanced memory CD8 T cell expansion and reduced viral load observed in IL-10−/− mice was recapitulated by delayed IL-10R blockade in wild-type mice. Collectively, these data demonstrate that IL-10 restricts the accumulation of functional MCMV-specific memory T cells during MCMV infection. In vivo, MCMV infection leads to chronic activation of APCs (54) and the generation of highly differentiated, activated memory CD8 T cells (22, 24); these observations suggest that, after the resolution of acute infection, mice harbor nonreplicating, reactivating and, possibly, low levels of chronically replicating CMV that drives the immune activation (55–57). In the current study, 3.7–8.3% of splenic IFN-γ+ MCMV-specific memory CD4 T cells from MCMV-infected mice expressed IL-10. The production of IL-10 by Th1-like cells is triggered by chronic stimulation in parasitic infections (58, 59), and prolonged stimulation of HCMV-specific CD4 T cells in vitro induces IL-10/IFN-γ coexpression (60). Similarly, we observed that MCMV infection led to an increased frequency of IL-10–expressing CD11b+ cells. Although we cannot exclude the possibility that MCMV may encode a protein(s) that selectively induces IL-10 expression by these cell subsets, our data imply that IL-10 expression by MCMV-specific CD4 T cells and monocytes/macrophages is a consequence of chronic activation, which, in this model, is likely to be provided by persistent viral reactivation from latency and, possibly, undetectable chronic replication. B cells are a significant source of IL-10 during acute systemic MCMV infection (53). Although chronic/latent infection did not increase the proportion of IL-10–producing CD19+ cells in the spleen as compared with naive mice, we cannot exclude the possible importance of this cell subset. Intracellular cytokine staining is a relatively insensitive technique and may therefore underestimate the frequency of IL-10–producing CD19+ cells. Furthermore, given that ~50% of splenocytes were CD19+ at day 90 postinfection (I. Humphreys, unpublished observations), even the small percentage of CD19+ IL-10 producers suggested by our data could have a significant impact on antiviral immunity. Interestingly, although IL-10 expression was detected in the lungs of mice at day 90 postinfection, this was not increased compared with naive controls (data not shown). Whether or not this reflects the small numbers of virus-specific CD4 T cells in the lungs of chronic/latently infected mice in our model, or the presence of IL-10–producing interstitial macrophages (61) in both uninfected and infected mice, is not clear. The amplification of CD8 T cell inflation in IL-10−/− mice was striking and maintained 10 mo postinfection without causing overt signs of disease (weight loss and cachexia) or pathology (M. Jones and I. Humphreys, unpublished observations). In some models, IL-10 directly inhibits CD8 T cells (62, 63), whereas in other situations, IL-10 actually promotes primary (64) and memory CD8 T cell responses (64, 65). In our system, inflationary CD8 T cells expressed low levels of IL-10R (data not shown), thereby suggesting that these cells might be refractory to direct IL-10–mediated effects. Interestingly, enhanced CD8 T cell responses in IL-10−/− mice were accompanied by increased numbers of CD4 T cells and APCs. Inflationary CD8 T cell responses are partially dependent on CD4 T cells (48, 49), thereby implying that elevated CD4 T cell help in IL-10−/− mice promoted CD8 T cell expansion. Interestingly, IE3-specific CD8 T cells, which are more sensitive to CD4 depletion than other memory CD8 T cells (49), were preferentially expanded in IL-10−/− mice. Collectively, these data suggest that IL-10 limits memory CD8 T cell expansion via the abrogation of effective CD4 T cell help. Expansion of CD8 T cell numbers was not observed 7 d postinfection, as reported previously (52). Primary MCMV-specific CD8 T cell responses occur independently of CD4 T cell help (48, 49), suggesting that IL-10–mediated inhibition of CD4 T cells only limits memory CD8 cells. Interestingly, however, B cell-derived IL-10 inhibits primary CD8 T cell responses following s.c. infection (53). Whether or not these differences reflect the different mouse strains or infection routes used in this study, variation in how peptide-specific CD8 T cells were enumerated (percentages versus total numbers of splenic CD8 T cells) or the fact that we housed our IL-10−/− mice in specific pathogen-free conditions (and subsequently did not observe colitis in aged naive mice or mice infected with MCMV for 14 mo; data not shown) is unclear. The increased expansion of CD8 T cells in IL-10−/− mice was not due to altered expression of cytokine receptors (CD122 and CD127) or the absence of inhibitory molecules (KLRG-1). However, it is known that virus-specific CD8 T cells downregulate CD27 during latent MCMV infection (24, 66), and we found that the expression of this surface marker was further reduced in IL-10−/− mice. One possible functional consequence of CD27 downregulation in this study was reduced IL-2 production in response to Ag stimulation; this is consistent with previous studies linking cellular differentiation to the loss of IL-2 expression (67, 68) and suggests a role for CD4 T cell help in the maintenance of polyfunctional memory CD8 T cells (69). Furthermore, highly differentiated CD8 T cells express high levels of granzyme and perforin (66, 70, 71), thereby suggesting that these cells are cytotoxic. The increased accumulation in IL-10−/− mice of CD8 T cells that degranulate more readily on cognate Ag encounter further supports the conclusion that IL-10 restricts MCMV-specific cytotoxic T cell responses. In chronic lymphocytic choriomeningitis virus infection, dysregulated TNF production by CD8 T cells is rescued in IL-10−/− mice (33). However, in MCMV infection, virus-specific CD8 T cells sustain proinflammatory cytokine expression during latency (22). Indeed, 60–70% of virus-specific IFN-γ–producing CD8 T cells in wild-type mice coexpressed TNF. Therefore, enhanced TNF production by IL-10−/− CD8 T cells probably reflects increased activation rather than reversal of defective function. Furthermore, CD8 T cell functionality was not enhanced on a per cell basis following IL-10R blockade in wild-type mice (data not shown), highlighting that the qualitative restriction of CD8 T cell function by IL-10 was comparatively small as compared with the large effect on T cell numbers. Collectively, these data suggest that IL-10 predominately regulates inflationary CD8 T cell responses by inhibiting cellular accumulation at sites of viral infection. Importantly, MCMV burden was reduced in IL-10−/− mice and wild-type mice treated with an IL-10R blocking Ab. Expanded CD8 T cells in both situations were reactive to several viral proteins expressed during active replication, thereby implying that these cells do not directly recognize latently infected cells. Of particular interest was the expansion of IE3-specific CD8 T cells. IE genes are expressed during the early stages of viral replication, and IE3 is a checkpoint gene involved in the maintenance of latency (72). Patrolling IE-specific CD8 T cells may detect early reactivation events (73). It is therefore possible that the increased frequency of Ag recognition by IE3-specific cells may contribute to the more dramatic effect of IL-10 on this population. In support of this hypothesis, latent MCMV infection of BALB/c mice induces the inflation of IE1-specific CD8 T cells (19, 21) that terminate viral reactivation in vivo (74). Alternatively, however, it is conceivable that enhanced memory T cell responses in the absence of IL-10R signaling may inhibit low levels of undetectable chronic replication, which, in turn, restricts the establishment of latent infection in the spleen and lung. The exact mechanism by which expanded CD8 T cells reduced viral load following IL-10 gene deletion or IL-10R blockade is also unclear. Both approaches led to enhanced numbers of CD8 T cells in the spleen and lung that could degranulate efficiently; in conjunction with the reduced levels of CD27 expression, this implies an enhanced capability to kill cells harboring reactivating and/or replicating virus. Indeed, elevated TNF secretion by CD8 T cells in the absence of IL-10R signaling may promote splicing of IE3 transcripts and subsequent viral reactivation (75). In this situation, which could be implied by the preferential expansion of IE3-specific CD8 T cells in IL-10−/− mice, increased numbers of cytotoxic T cells would detect and kill cells harboring this reactivating virus. Alternatively, increased accumulation of T cells expressing IFN-γ and TNF might directly inhibit late gene expression during viral reactivation and/or replication (76–78) and may also activate secondary antiviral mechanisms mediated by other cell types, such as macrophages and NK cells (79–81). The factors that determine whether a MCMV-specific CD8 T cell population inflates are currently unknown. However, the observation that inflationary but not stable memory CD8 T cells are enhanced in IL-10−/− mice implies that IL-10 is not a determining factor in this process. Rather, IL-10 appears to limit the expansion of memory CD8 T cells that are already dividing during chronic/latent infection. The data presented in this paper provide evidence that, as previously suggested (37, 82), IL-10 orthologs expressed by herpesviruses including HCMV (34) and EBV (83) may function to preserve latent viral load within the host. It should be noted, however, that MCMV does not encode an obvious IL-10 ortholog, and the kinetics and locality of expression of host and viral IL-10 proteins may differ in vivo. Furthermore, HCMV (84) and EBV (85) IL-10 orthologs promote B cell growth and differentiation, whereas in our model, we observed no effect of murine IL-10 on B cell accumulation. Although we hypothesize that the increased numbers of CD4 T cells in IL-10−/− mice may compensate for the absence of direct IL-10R signaling in B cells, we cannot exclude the possibility that mammalian and viral IL-10 proteins could function differently in vivo. Irrespective, our data clearly highlight the previously unappreciated role for mammalian IL-10 in the regulation of memory T cell inflation in vivo and suggest that this immune regulatory pathway could be manipulated to promote the accumulation of functional antiviral memory T cells. We thank Awen Gallimore, Andrew Godkin, Gavin Wilkinson, Phil Taylor, and Ann Ager for helpful discussion, Rhonda Cardin for advice regarding the in vitro viral reactivation assay, and Andrea Loewendorf and Alec Redwood for advice on MCMV genome detection. This work was supported by the Wellcome Trust and the Medical Research Council. I.R.H. is a Wellcome Trust Research Career Development Fellow, D.A.P. is a Medical Research Council Senior Clinical Fellow, M.F.Q. is a Marie Curie International Outgoing Fellow, and M.A.S. is a Cardiff University I3-Interdisciplinary Research Group/Medical Research Council student. 1999. The pathogenicity of cytomegalovirus. FEMS Microbiol. Rev. 23: 457–482. 1995. Pathogenesis of cytomegalovirus pneumonia in immunocompromised hosts. Semin. Respir. Infect. 10: 199–208.
. 2007. Cytomegalovirus in transplantation—challenging the status quo. Clin. Transplant. 21: 149–158.
. 1982. Cytotoxic T cells in cytomegalovirus infection: HLA-restricted T-lymphocyte and non-T-lymphocyte cytotoxic responses correlate with recovery from cytomegalovirus infection in bone-marrow-transplant recipients. N. Engl. J. Med. 307: 7–13.
. 1991. Cytotoxic T-lymphocyte response to cytomegalovirus after human allogeneic bone marrow transplantation: pattern of recovery and correlation with cytomegalovirus infection and disease. Blood 78: 1373–1380.
. 2008. Patterns of cytomegalovirus reactivation are associated with distinct evolutive profiles of immune reconstitution after allogeneic hematopoietic stem cell transplantation. J. Infect. Dis. 198: 818–826.
. 2008. Functional impairment of cytomegalovirus specific CD8 T cells predicts high-level replication after renal transplantation. Am. J. Transplant. 8: 990–999.
. 2002. Infusion of cytomegalovirus (CMV)-specific T cells for the treatment of CMV infection not responding to antiviral chemotherapy. Blood 99: 3916–3922.
. 1995. Reconstitution of cellular immunity against cytomegalovirus in recipients of allogeneic bone marrow by transfer of T-cell clones from the donor. N. Engl. J. Med. 333: 1038–1044.
. 2005. Adoptive transfer of cytomegalovirus-specific CTL to stem cell transplant patients after selection by HLA-peptide tetramers. J. Exp. Med. 202: 379–386.
. 1985. Interstitial murine cytomegalovirus pneumonia after irradiation: characterization of cells that limit viral replication during established infection of the lungs. J. Virol. 55: 264–273.
. 1987. CD8-positive T lymphocytes specific for murine cytomegalovirus immediate-early antigens mediate protective immunity. J. Virol. 61: 3102–3108.
. 1988. Adoptive immunotherapy of murine cytomegalovirus adrenalitis in the immunocompromised host: CD4-helper-independent antiviral function of CD8-positive memory T lymphocytes derived from latently infected donors. J. Virol. 62: 1061–1065.
. 1998. Reconstitution of CD8 T cells is essential for the prevention of multiple-organ cytomegalovirus histopathology after bone marrow transplantation. J. Gen. Virol. 79: 2099–2104.
. 1998. Hierarchical and redundant lymphocyte subset control precludes cytomegalovirus replication during latent infection. J. Exp. Med. 188: 1047–1054.
. 2005. Broadly targeted human cytomegalovirus-specific CD4+ and CD8+ T cells dominate the memory compartments of exposed subjects. J. Exp. Med. 202: 673–685.
. 2000. Functional heterogeneity and high frequencies of cytomegalovirus-specific CD8+ T lymphocytes in healthy seropositive donors. J. Virol. 74: 8140–8150.
. 2006. Four distinct patterns of memory CD8 T cell responses to chronic murine cytomegalovirus infection. J. Immunol. 177: 450–458.
. 2000. Enrichment of immediate-early 1 (m123/pp89) peptide-specific CD8 T cells in a pulmonary CD62Llo memory-effector cell pool during latent murine cytomegalovirus infection of the lungs. J. Virol. 74: 11495–11503.
. 2002. 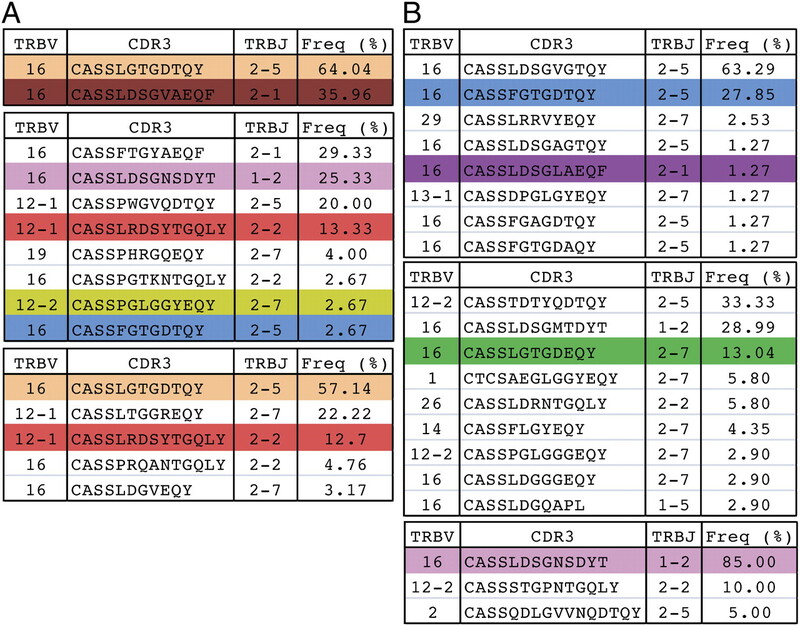 Proliferation requirements of cytomegalovirus-specific, effector-type human CD8+ T cells. J. Immunol. 169: 5838–5843.
. 2008. Strategies for use of IL-10 or its antagonists in human disease. Immunol. Rev. 223: 114–131.
. 1993. Interleukin-10. Annu. Rev. Immunol. 11: 165–190.
. 2008. IL-10 and natural regulatory T cells: two independent anti-inflammatory mechanisms in herpes simplex virus-induced ocular immunopathology. J. Immunol. 180: 6297–6306.
. 2007. Cytomegalovirus exploits IL-10–mediated immune regulation in the salivary glands. J. Exp. Med. 204: 1217–1225.
. 2006. Resolution of a chronic viral infection after interleukin-10 receptor blockade. J. Exp. Med. 203: 2461–2472.
. 2006. Interleukin-10 determines viral clearance or persistence in vivo. Nat. Med. 12: 1301–1309.
. 2000. Human cytomegalovirus harbors its own unique IL-10 homolog (cmvIL-10). Proc. Natl. Acad. Sci. USA 97: 1695–1700.
. 2009. Virus-encoded homologs of cellular interleukin-10 and their control of host immune function. J. Virol. 83: 9618–9629.
. 2004. A novel viral transcript with homology to human interleukin-10 is expressed during latent human cytomegalovirus infection. J. Virol. 78: 1440–1447.
. 2009. The role of the human cytomegalovirus UL111A gene in down-regulating CD4+ T-cell recognition of latently infected cells: implications for virus elimination during latency. Blood 114: 4128–4137.
. 2005. A lymphotoxin-IFN-β axis essential for lymphocyte survival revealed during cytomegalovirus infection. J. Immunol. 174: 7217–7225.
. 2008. Cutting edge: murine cytomegalovirus induces a polyfunctional CD4 T cell response. J. Immunol. 180: 6472–6476.
. 2003. IMGT unique numbering for immunoglobulin and T cell receptor variable domains and Ig superfamily V-like domains. Dev. Comp. Immunol. 27: 55–77.
. 2006. Genome-wide analysis reveals a highly diverse CD8 T cell response to murine cytomegalovirus. J. Immunol. 176: 3760–3766.
. 2008. The molecular basis for public T-cell responses? Nat. Rev. Immunol. 8: 231–238.
. 2009. Public clonotype usage identifies protective Gag-specific CD8+ T cell responses in SIV infection. J. Exp. Med. 206: 923–936.
. 2006. Continuous recruitment of naive T cells contributes to heterogeneity of antiviral CD8 T cells during persistent infection. J. Exp. Med. 203: 2263–2269.
. 2007. OX40 costimulation promotes persistence of cytomegalovirus-specific CD8 T Cells: a CD4-dependent mechanism. J. Immunol. 179: 2195–2202.
. 2009. CD4+ T cell help has an epitope-dependent impact on CD8+ T cell memory inflation during murine cytomegalovirus infection. J. Immunol. 183: 3932–3941.
. 1999. Murine cytomegalovirus infection down-regulates MHC class II expression on macrophages by induction of IL-10. J. Immunol. 162: 6701–6707.
. 2008. The dynamics of mouse cytomegalovirus-specific CD4 T cell responses during acute and latent infection. J. Immunol. 181: 1128–1134.
. 2008. Increased weight loss with reduced viral replication in interleukin-10 knock-out mice infected with murine cytomegalovirus. Clin. Exp. Immunol. 151: 155–164.
. 2009. Nonredundant roles for B cell-derived IL-10 in immune counter-regulation. J. Immunol. 183: 2312–2320.
. 2008. Murine model of cytomegalovirus latency and reactivation. Curr. Top. Microbiol. Immunol. 325: 315–331.
. 2005. T cells and viral persistence: lessons from diverse infections. Nat. Immunol. 6: 873–879.
. 2007. CD4+CD25−Foxp3− Th1 cells are the source of IL-10–mediated immune suppression in chronic cutaneous leishmaniasis. J. Exp. Med. 204: 285–297.
. 2007. Conventional T-bet+Foxp3− Th1 cells are the major source of host-protective regulatory IL-10 during intracellular protozoan infection. J. Exp. Med. 204: 273–283.
. 2009. Identification and characterization of IL-10/IFN-γ–producing effector-like T cells with regulatory function in human blood. J. Exp. Med. 206: 1009–1017.
. 1992. IL-10 inhibits human T cell proliferation and IL-2 production. J. Immunol. 148: 1143–1148. 1995. CD8 T cell clones inhibit antitumor T cell function by secreting IL-10. J. Immunol. 155: 5719–5727.
. 2005. Priming in the presence of IL-10 results in direct enhancement of CD8+ T cell primary responses and inhibition of secondary responses. J. Immunol. 174: 5382–5389.
. 2006. IL-10 is required for optimal CD8 T cell memory following Listeria monocytogenes infection. J. Immunol. 177: 2565–2574.
. 2005. Properties of murine (CD8+)CD27− T cells. Eur. J. Immunol. 35: 3131–3141.
. 2007. Immunization with vaccinia virus induces polyfunctional and phenotypically distinctive CD8+ T cell responses. J. Exp. Med. 204: 1405–1416.
. 2008. Brief antigenic stimulation generates effector CD8 T cells with low cytotoxic activity and high IL-2 production. J. Immunol. 180: 4507–4513.
. 2008. CD4+ T cell help improves CD8+ T cell memory by retained CD27 expression. Eur. J. Immunol. 38: 1847–1856.
. 2006. Three memory subsets of human CD8+ T cells differently expressing three cytolytic effector molecules. J. Immunol. 177: 4330–4340.
. 1999. Patchwork pattern of transcriptional reactivation in the lungs indicates sequential checkpoints in the transition from murine cytomegalovirus latency to recurrence. J. Virol. 73: 8612–8622.
. 2006. Murine model of cytomegalovirus latency and reactivation: the silencing/desilencing and immune sensing hypothesis. In Cytomegaloviruses: Molecular Biology and Immunology. Reddehase M. J., ed. Caister Academic Press, Wymondham, Norfolk, U.K., p. 483–500.
. 2006. CD8 T cells control cytomegalovirus latency by epitope-specific sensing of transcriptional reactivation. J. Virol. 80: 10436–10456.
. 2005. Role for tumor necrosis factor α in murine cytomegalovirus transcriptional reactivation in latently infected lungs. J. Virol. 79: 326–340.
. 1998. Interferon γ regulates acute and latent murine cytomegalovirus infection and chronic disease of the great vessels. J. Exp. Med. 188: 577–588.
. 1993. Interferons inhibit onset of murine cytomegalovirus immediate-early gene transcription. Virology 197: 303–311.
. 1994. Late phase inhibition of murine cytomegalovirus replication by synergistic action of interferon-γ and tumour necrosis factor. J. Gen. Virol. 75: 101–110.
. 1983. Interleukin 2 enhances natural killer cell activity through induction of γ interferon. Infect. Immun. 41: 992–997.
. 1995. The T-cell–independent role of γ interferon and tumor necrosis factor α in macrophage activation during murine cytomegalovirus and herpes simplex virus infections. J. Virol. 69: 904–909.
. 1996. Characterization of early IL-12, IFN-αβ, and TNF effects on antiviral state and NK cell responses during murine cytomegalovirus infection. J. Immunol. 156: 4746–4756.
. 2008. Immunomodulatory properties of a viral homolog of human interleukin-10 expressed by human cytomegalovirus during the latent phase of infection. J. Virol. 82: 3736–3750.
. 1990. Expression of interleukin-10 activity by Epstein-Barr virus protein BCRF1. Science 250: 830–832.
. 2008. Stimulation of B lymphocytes by cmvIL-10 but not LAcmvIL-10. Virology 374: 164–169.
. 1992. Interleukin 10 is a potent growth and differentiation factor for activated human B lymphocytes. Proc. Natl. Acad. Sci. USA 89: 1890–1893.